The City of Mount Vernon received mitigation funds from private developers that have been used to enhance and rehabilitate the existing wetland areas within the east side of Bakerview Park. The enhancement and rehabilitation activities started in the Fall of 2009 and are continuing. This project will be completed in four phases. Phase I is nearly complete as of May 2010. The additional phases will be completed as funds become available. 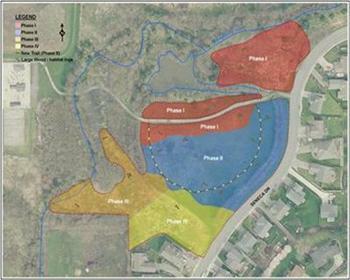 Following is a map that shows the approximate phasing boundaries for this project. We also included documents that had to be created and approved by different Federal and State agencies before this project could begin, along with other general information with regard to this project.